This holiday season brings a delightful collaboration with fashion house Alice and Olivia by Stacey Bendet. Sophisticated and eclectic, this 12-fl oz ceramic coffee mug epitomizes Bendet's playful sensibility and quirky style, incorporating her renowned black-and-white palette and handpainted metallic accents. 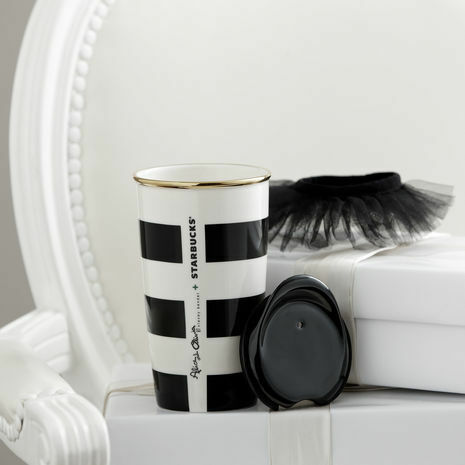 The mug features a black press-in lid and double-wall construction to help keep hands cool and drinks warm, and it comes complete with a fun black tutu and a beautiful box for gifting. As an avid tea drinker and occasional coffee indulger, I believe I deserve a fancy looking on-the-go mug. I mean seriously, I travel to-and-from work nearly seven days a week (yes, I mean nearly everyday) with an unpleasant looking, bulky, stainless steel thermos mug! So for Christmas, I would love love love this Double Wall Ceramic Mug by Alice+Olivia which you can get at any Starbucks® location for just $19.95. Perhaps a Kris Kringle or stocking stuffer gift? I mean, it's the small things that make me one happy girl and I promise I'll make use of it every single day! Look how cute that black tutu is! Plus, if you know me, you know I'm a sucker for the black and gold combo or gold anything, really. How can you resist not getting it for me?